7 in x 10 ft. x 6 in. 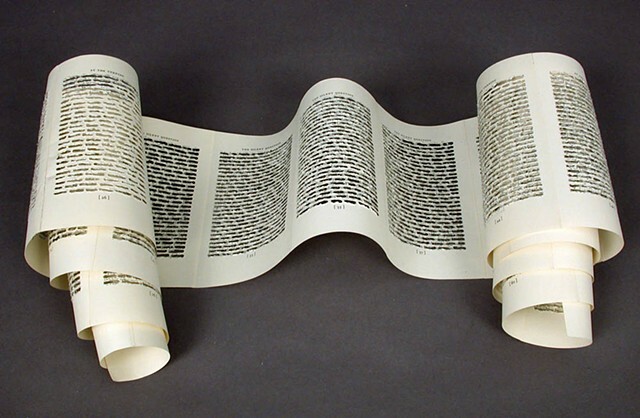 The pages from a book of lectures by Martin Buber in 1951, not long after the full extent of the Holocaust became known, are reconfigured here from a codex into a scroll. The voided text transforms the scroll into a diaphanous veil-like paper, inviting the eye to look behind and beyond all words and meaning and into the Void itself. Tradition holds that the entirety of creation can be discerned within each letter-- of the Torah. God, through the Word, brought forth creation from the formless Void; now through Buber's text, made void, we contemplate the silent question--: How does we one find God in the nothingness?